Sometimes the simplest food turns out to be the best. These Mongolian "Buuz" dumplings which are commonly eaten steamed, were not only fun and easy to make but surprisingly tasty, despite only using garlic, onions and caraway seeds to season the ground lamb filling. Topped with a little bit of butter and fresh ground pepper, my crew gobbled these up in seconds. Whether you're looking for a fun project to do with kids, or a treat for no special reason, these dumplings are ideal. Any ground meat could be substituted for lamb, but I think lamb is the thing. 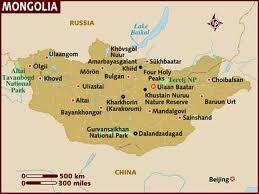 Located in East and Cental Asia, Mongolia is bordered by Russia to the north and China to the south, east and west. Although Mongolia does not border Kazakhstan, it is only 24 miles from the country's eastern tip. Founded by Genghis Khan in 1206, Mongolia gained independence from China until 1921 and finally achieved international recognition as recently as 1945. Following this period, Mongolia was heavily influenced by Russia and the Soviet Union, but in 1990, the country formed a multi-party system and constitution, and in 1992, a market economy emerged. The Tibetan Buddhist culture predominates in Mongolia. Cusine in Mongolia reflects both the extreme continental climate, which reaches temperatures of -40C, and the nomadic life style that 30% of the population practices. For that reason, dairy, meat and animal fats with very few spices or vegetables, are the basis for most Mongolian diets. Just as the Arctic Inuits subsist on a diet rich in animal fat, so too, the Mongolian's - particularly those who work outside, insulate their bodies against the cold in this way. Food is influenced by Chinese and Russian traditions, and meats such as mutton, cattle, horse and yak are typical. Yogurt, curds and kefir are commonly eaun dairy products. Mix flour and water together with a wooden spoon until blended and dough is smooth and elastic, but not dry. If you need to add a little water, do so a teaspoon at a time to avoid making the dough too sticky. On a floured surface, pull off golf ball sized pieces. Using the palm of your hand, gently flatten out. Next, roll out a 6-7-inch circles. Combine all the ingredients until thoroughly blended (your hands will work best). Holding the circle of dough in your hand, fill each circle with a tablespoon of the filling. Starting on one side, lift the dough up and around the filling and pinch it between your thumb and forefinger, working your way around the dumpling, leaving a small opening at the top. Using a metal or bamboo steamer, place dumplings (try not to crowd them) side by side and steam for approximately 12-15 minutes. Remove, top with a little butter and season with freshly ground black pepper. Final Assessment: These are wonderful, delicious and easy to make. They're perfect as snack, accompanied by soup or as an appetizer before a meal. Which ever you choose, these little dumplings are all kinds of divine. I'm still reading through all of your posts. I was wondering what you were going to do for Mongolia! I've done 52 countries, so far, this was my second one and has been the one to vex me the most! I cannot get my husband to eat lamb, no way, no how!! I would up improvising a version of Zuivan that I made with fatty beef ribs and suprisingly enough, it was tasty! Try as I might, I could not find airag to drink, though...LOL! I was wondering if, in your search, you ran across photos of Mongolian boodog? LOL! Don't google it, you'll be scarred for life and I'm not sure it would be legal here...LOL! Great job, the Buuz looks fantastic! I wonder if you could substitute pork and make these? I know you want to be authentic, but for your husband's sake, an adaptation might be the way to go! LOL! I made that plain and clear from the get-go that I knew I wasn't going to be able to get certain things, because of Bob (or the dreaded husband, as I sometimes call him) or because of my budget constraints. I said right from the beginning that I would be the Substitution Queen, but I would try to keep as close as possible. There was a huge uproar over my Ireland menu...it was recommended to me to make a cockle soup...go figure, I live on the coast but we don't have cockles here...LOL! Anyway, I'm the sub queen!